When I bought an iPad, one thing I was really looking forward to doing was reading through my list of subscribed feeds every day. The iPad struck me as the perfect device for doing this. It’s portable, responsive and is just about the best content consumption device I’ve had the joy of owning. And one of the aspects of the iPad that makes it such a great content consumption device is the app store, and the thousands of apps therein. And because of the app store, anyone who wants to read their feeds on their iPad has some options. I’ve picked up a number of feed readers since buying an iPad, so I bought I’d run through three of my favourites, all of which take fundamentally different approaches to reading your feeds. 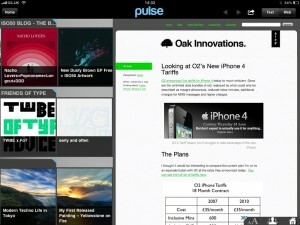 I’m looking at News Rack, Reeder and Pulse. News Rack is the RSS reading app I’ve used the most over the last few weeks. Like all the apps I’m looking at it offers Google Reader integration, including folders, starred items and when your read an item in News Rack it gets read in the web version of Google Reader as well. The drawback of this integration is that News Rack can take an age to sync. In fact, the syncing seems a bit unreliable. On a number of occasions I’ve marked an item as read in News Rack only to find back from the dead in the web version, like an unpleasant zombie news item. It also seems inexplicable that there’s no “Open in Safari” option, which makes sharing items a painful process for people who use custom link shorteners (like me). But apart from those slight annoyances, the app works pretty smoothly. Like most good apps, News Rack exposes additional functionality to expert users. For example, it may not be immediately obvious that when viewing your list of folders, touching the folder name will take you to a list of feeds whilst touching the blue unread count will take you to the list of unread items across all the feeds in that folder. Of the apps I’m looking at here, this app is the most iPad like. If you’ve used the iPad mail app, you’ll know exactly how to use this. Sone people will see this as a positive, others a negative. It wouldn’t be far to call the interface utilitarian, on any other platform it would be considered good looking, but on the iPad, it does nothing special to make you want to use it. The impression you get is that the News Rack developer wanted to deliver a familiar, competent experience, and in many ways they succeed. As a user, you just have to ask yourself whether that’s the experience you want on your iPad. From Reeder’s homepage, which shows a list of folders from your Google Reeder account, you can tap a stack to view all unread items or… …you can reverse pinch the stack to see a list of feeds within. Reeder is the newest of the three I’m looking at, but shouldn’t be unfamiliar to those who have come to rely on the excellent iPhone app. 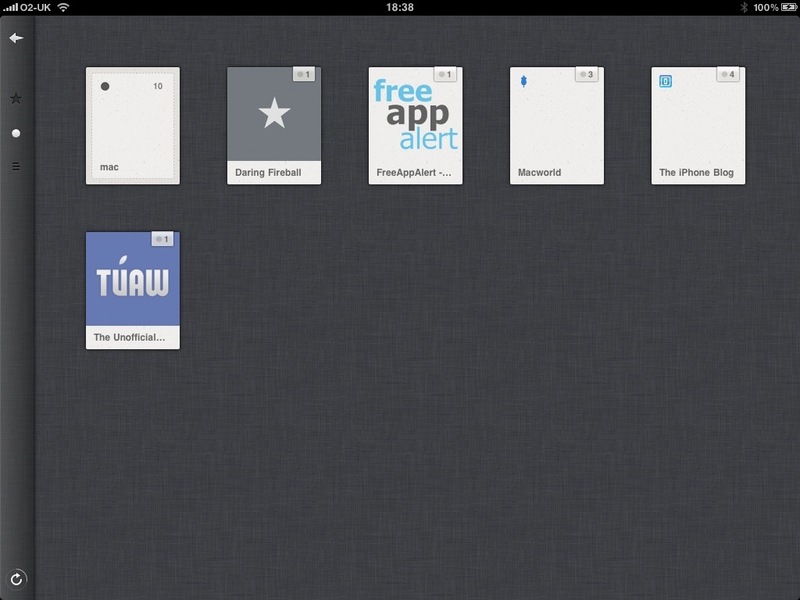 In terms of functionality, Reeder is very similar indeed to News Rack. It syncs with Google Reader in all the usual ways, lets you view the content enclosed in the feed or the page it links to in an integrated browser. Where the two differ hugely though is in aesthetics. News Rack is functional, if not beautiful. Reeder manages to be beautiful and functional. If you were using two words describe its looks, they would be stark and minimalist. There’s a very strong, consistent aesthetic theme to Reeder. From the icon through to the reading experience it’s like reading a book. There’s no untextured background anywhere in this app, and the attention to detail is phenomenal. 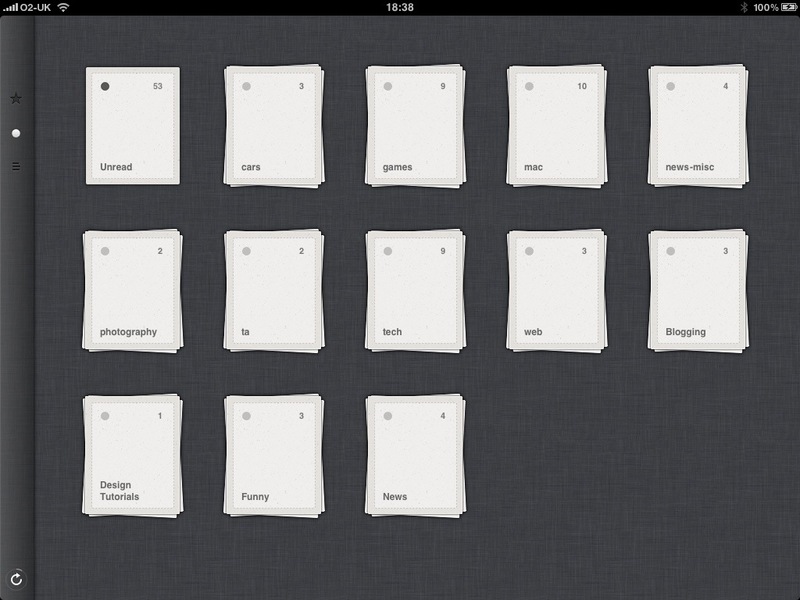 When launching the app, providing you’ve signed in to Google Reader, you’re presented with various piles of paper. 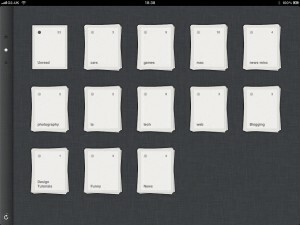 Each of these represent your Google Reader folders. From here, you have options. You can either tap stack to get a list of unread items in that folder. Alternatively you can use two fingers in a reverse pinch manoeuvre (isn’t that a submission hold in MMA?) to explode the stack into the constituent feeds, the same interaction that the iPad’s Photos app utilises. And underlining Reeder’s attention to detail, if there’s a high quality favicon available, it will use it in the list of feeds (as you can see from some of the screenshots, not all sites have these yet). One of my favourite aspects of Reeder is the underlying design philosophy. The developers put some serious thought into what the reading experience should be like on an iPhone, and then extended that onto the iPad. Apart from the first tap, you could navigate through all your unread items whilst holding your iPad in one hand and using the same hand to navigate with the thumb. They pull this off by utilising the swipe move. Swiping up or down navigates through your items. Swiping right takes you back to your list of items. It’s elegant simplicity and means you can churn through a vast number of feeds very very quickly. 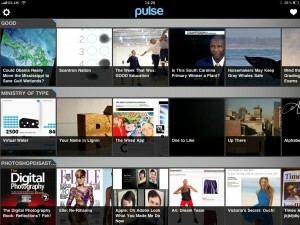 After a while it becomes second nature, and all the tapping back and forth in apps like News Rack becomes very tedious. I think the difference between the two apps is that one was built having seen Apple’s Mail in action, whilst the other was built after being not satisfied with Apple’s Mail. 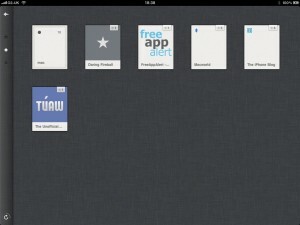 When people talk about the second generation of iPad apps, Reeder is what they have in mind. Reeder takes what works from existing apps and builds upon them. Standing on the shoulders of giants, if you will. 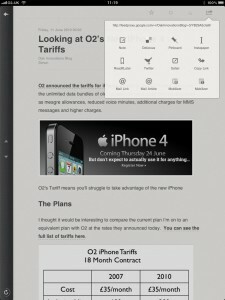 Of course, one of the apps that Reeder for iPad is built on top of is Reeder for iPhone, my favourite iPhone RSS Reader. 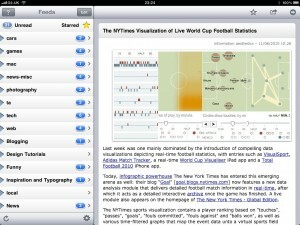 This really shows in that none of the problems evident with News Rack are problems for Reeder. It syncs very quickly and I’ve not had any zombie news items yet. Coming back to this idea of consistency and attention to detail, I’d like to use the image to the right to demonstrate. I’m viewing an item and I have the share menu extended. The 12 icons in this menu all follow the same aesthetic as the rest of the application, but that’s not all that’s going on. In the bottom left hand corner you can see a refresh button. Around this button is a semi-circle which acts as a progress bar, growing as Reeder refreshes (and crucially, downloads images) in the background. Everything fits into the common and consistent minimalist aesthetic. You might be getting the impression that Reeder is the perfect solution, but it’s not. One particularly frustrating interface mechanism it uses is swiping side to side in order to star or mark items as read/unread when viewing a list of items. This isn’t a bad idea in itself, but the implementation makes it frustrating. It’s just too sensitive, which makes it difficult to scroll up and down lists of items without a certain degree of concentration. It seems that a user would be far more likely to be scrolling up and down a list than side to side, so maybe they could require more “weight” to move each item sideways than it takes to move it up and down. Conversely, when reading an individual item it takes probably a little too much effort to move up and down to the next or previous item. Also worth pointing out is that I’ve caused it to crash a number of times, particularly when switching between landscape and portrait orientation or when viewing a video in the integrated browser. Some people have also criticised the application for being drab and colourless. I don’t agree. It’s minimalist and the splashes of colour come from the feeds you’re reading, not from the app itself. When I’m trying to read a large number of feeds, I don’t want to be distracted by the app I’m using. For me, Reeder strikes the balance perfectly. However, it will come down to personal preference. So we’ve seen one app that follows Apple’s UI conventions, almost to a flaw, and one that completely breaks away to deliver a stark, minimalist interface. 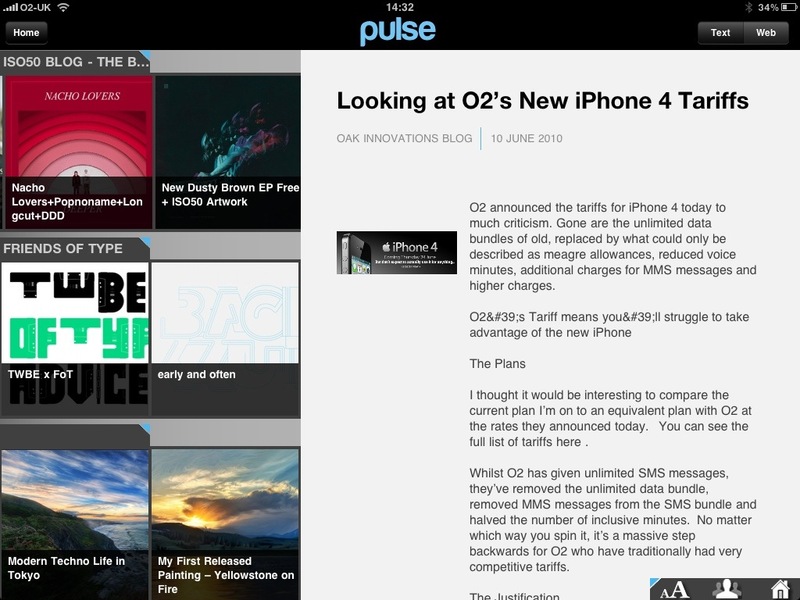 Pulse, our third application, takes a completely different approach. It’s so different that even calling it an RSS reader is perhaps a bit misleading. Rather, it’s an app that uses RSS to pull content. Pulse offers Google Reader integration, but that integration takes a more restricted form than the other apps we’ve looked at. All Pulse allows you to do (currently) is select feeds you’ve subscribed to in Google Reader to use here. Reading items in Pulse does not mark them as read in Google Reader (and vice versa) and there’s no support for starring items nor folders. To call this lack of integration a flaw would be disingenuous. Pulse just takes a completely different approach. 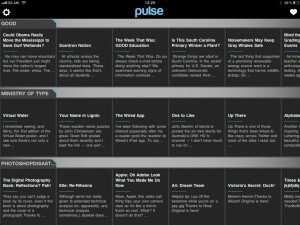 Pulse is not about working your way through 100s of feeds, but rather about enjoying a select number of feeds in a particular way. Pulse, as if to hammer home this philosophy, limits you to a maximum of 20 feeds at any one time. Pulse’s strength is the way it presents feeds to the reader. Instead of a list of post titles you get a grid filled with images. it appears that Pulse goes through the feeds and extracts the first image it comes across, it then adds that image to the grid. The result is pretty stunning, and it feels like your holding the future of news consumption in your hand. Tapping an item makes the content behind it slide in from the right, which also pushes the area you touched to the left so that it’s still visible. From here you have the option to view the text or web version of the article, or share it. There are a couple of things to note here. When Pulse says “Text” view, it really means it. The image you saw on the main grid is presented to the left of the text but all other images are stripped out. 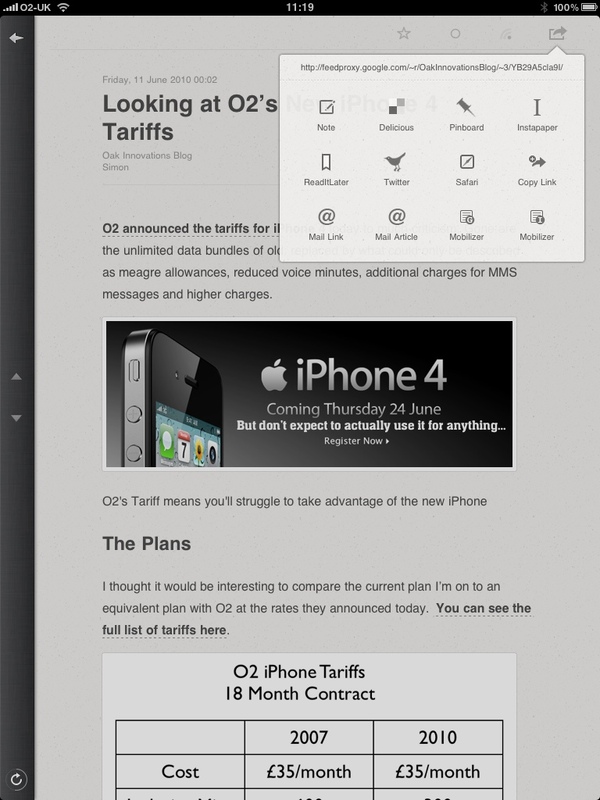 Also stripped out is any formatting you may have added (including headers) and links. It also seems to struggle somewhat with certain characters – as you can see from the screenshot to the right, apostrophes seem to cause it issues in the body text. For an app that appears to pride itself on its looks, these seem like strange oversights. Fortunately the typography is very legible and attractive. Fortunately you can quickly and easily switch to “Web” view, which shows you the linked article in an embedded web browser. 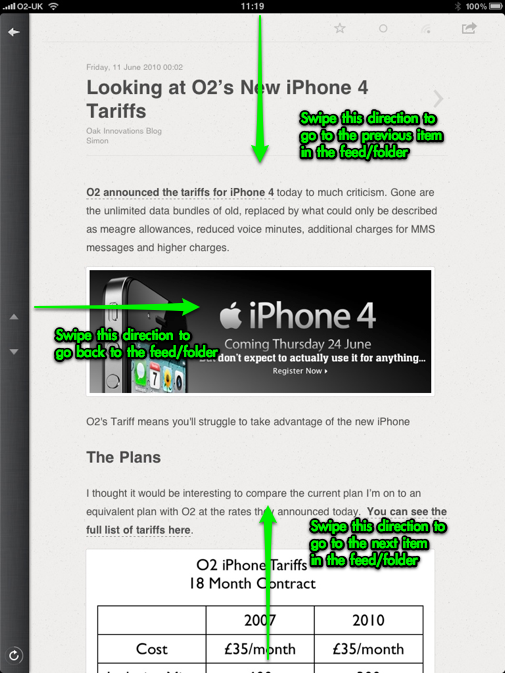 The image to the right shows the same story as the one shown above but this time in “Web” view rather than text view. This in itself has some problems. The area dedicated to viewing the content when in this view is slightly too small for some sites, making it difficult to read comfortably. This leaves you with a strange choice, you can have an unformatted, readable slab of text which will be missing many of the aspects the content producer wanted you to see – or – an article formatted the way it was meant to be but very possibly too small to read comfortably. Unfortunately, there are other issues with Pulse. One that keeps coming up again and again for me is an issue loading the images from feeds. First time I launch Pulse the first couple of rows populate but the rest do not (see image to the left, which is the exact same view as the first image in this section). Quitting the app and relaunching it seems to pull in the other images. Be aware that while Pulse is pulling in the images it can become unresponsive to the point where you might think it’s crashed. The omission of any sort of progress indicator doesn’t help. You might also find that even once the images have all loaded scrolling through the list still causes stutters. It all adds to the impression that the app perhaps needed a little more work to perfect. At this point I feel like I’ve been unduly harsh on Pulse – I actually really enjoy using it. There are two adaptations I’ve made to my habits in order for me to enjoy it. Firstly, I made sure that the feeds I loaded into it are image-heavy. There’s no point loading in a bunch of feeds that don’t include images. Secondly, I launch the app, wait a few seconds and then close it. I then launch it again. This seems to almost guarantee the images load. Pulse may surprise you in the way it navigates. Don’t think of it as a table of images on a sheet of paper that you can move around, it doesn’t work like that. Instead you move each row horizontally independently. This surprised me, and it may surprise you. 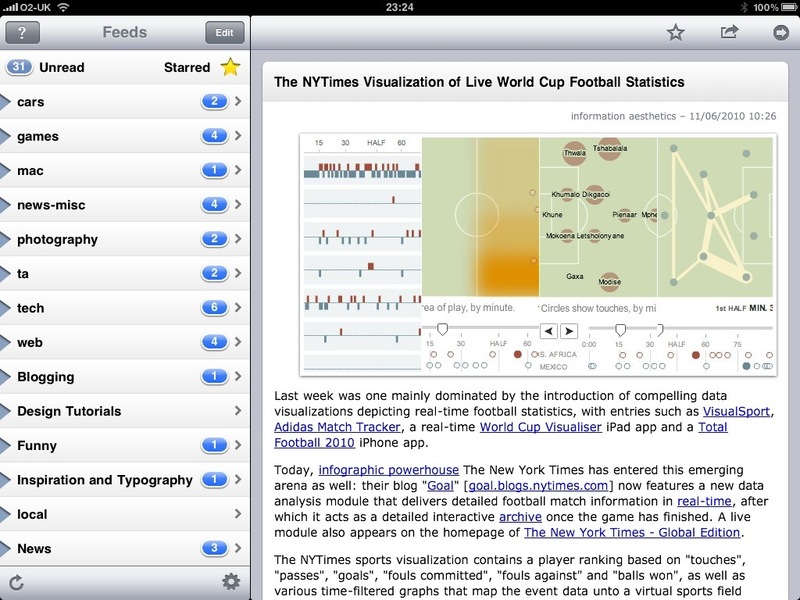 There are only two apps that can be fairly compared head to head, News Rack and Reeder. Pulse, whilst sounding similar actually occupies a different space and is used for a different purpose. 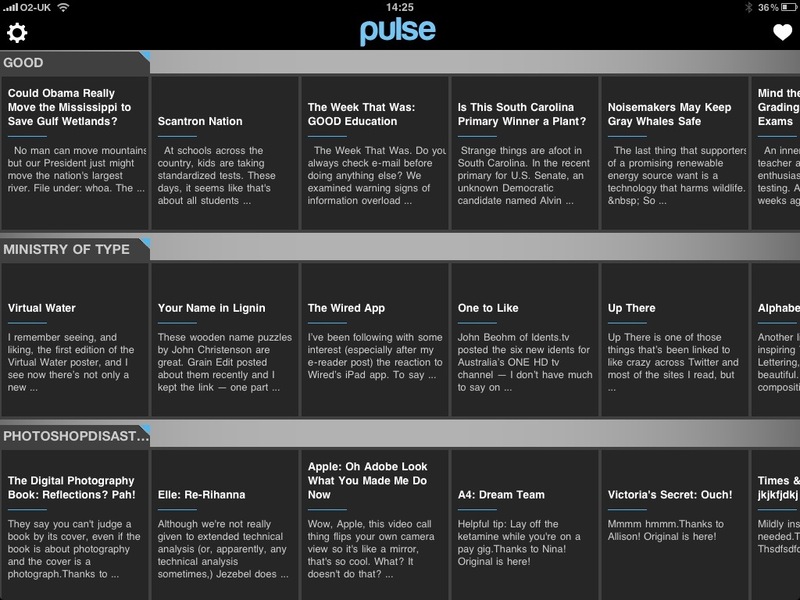 You aren’t going to use Pulse to trawl through 100s of feeds, reading many of them. That is the purpose for which News Rack and Reeder were designed. Out of the two, for that purpose, Reeder wins hands down. It’s more elegant, it’s easier to use and it feels like it was designed for a tablet. Since picking up Reeder I’ve stopped using News Rack. It’s odd that the touches that make News Rack an attractive iPhone app are completely missing whereas Reeder carries through the iPhone app’s look and feel and intuitive functionality. 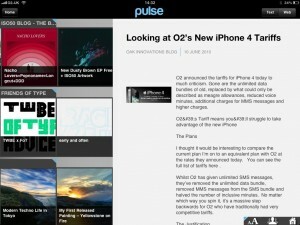 If Reeder is the app I use to catch up on my feeds, Pulse is the app I use when I’m bored. It’s a relaxing, enjoyable way to browse through content that suits discovery and inspiration more than heavy reading. All three apps are competent, similarly priced and the one you pick up will inevitably depend on what you want to do, and how you want to do it.